(Host) In Waterbury, hundreds turned out last night for a "flood recovery fair" that looked at a variety of long-term projects under consideration. Waterbury is one of two Vermont towns that’s working with FEMA on a long-term development plan as it recovers from Tropical Storm Irene. Rebecca Ellis is a state representative and she chairs Waterbury’s Select Board. She says the town has been studying how it can rebuild and be better prepared for future flooding. (Ellis) "For example, there are two bridges in Waterbury – the supports of the bridges are in the river, are in the Winooski River – and held up a lot of debris, and we want to find out, ‘How much did that contribute to the flooding? How much does it cost to redesign a bridge without supports? 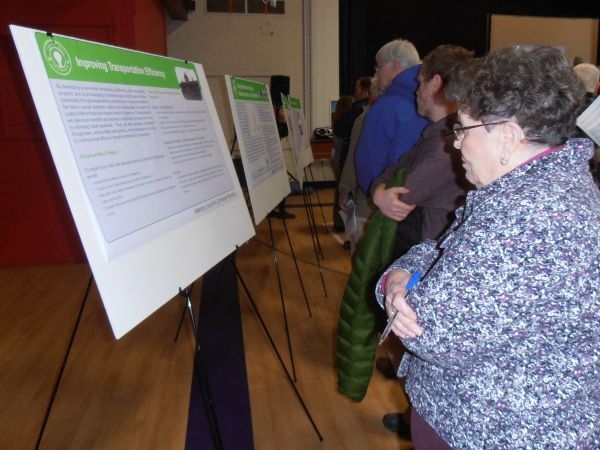 Would that really help reduce flooding in Waterbury?’"
(Host) Residents were asked to vote on more than 15 proposed projects. Ellis says the Select Board and Village Trustees will look at the results next week and begin to categorize the projects based on their importance. You can read select board minutes from Waterbury and comment on them at VPR’s Public Post.